Resilience. It’s the ability to adapt to changing conditions and to maintain or regain functionality in the face of stress or disturbance. In short, it is the capacity to bounce back. In August 2003, I was in Manhattan with some associates on a business trip. I insisted that we stay in The Hudson, my favorite hotel (winning out over their suggestion of a tall glass tower in Times Square). The Hudson is a renovated former SRO (single room occupancy, aka flophouse) built in 1928. It has tiny rooms, but authentic materials and, being one of the first of Philippe Starck’s hotel designs, it is full of up-to-the-minute trendy details. It turned out that our trip coincided with the Northeast Blackout of 2003, the biggest blackout the country had experienced. We were walking in SoHo, on our way to an appointment, when we realized the power was out in that building … no, in the whole block … actually all of Manhattan. We heard people saying the power was out all the way to Canada. Not knowing what to do, and with no choice really, we walked from SoHo back to our hotel, about four miles. By the time we got back, it was dark. We were allowed into our rooms and told to open the windows for ventilation. There were candles on the landing to light the way. We ate dinner from our minibars since no restaurants were open. We didn’t know what had happened, but we knew it was a major disaster. The next day, we walked to Penn Station to catch a train to Philadelphia so we could fly home from there. It took nearly a week for power to be fully restored. I tell this story because I later learned how fortunate we were. The operable windows in our old brick hotel allowed us to be able to occupy the building on that hot August night. The folks that stayed in the shiny glass towers ended up sleeping on the sidewalks. The modern buildings, with no functioning elevators and no operable windows, left hotel guests literally sleeping on the streets. As we consider the issue of designing for resilience, this becomes an issue of major importance. As our cities have grown and evolved, they have grown to suit the needs and desires of those who inhabit them in large and small ways. As a culture, we make decisions that shape our environment—one block, one building, at a time. We generally only consider designing to address climate concerns or other environmental shocks—but only after something has happened to impact us directly. The issues of sea-level rise don’t seem to have any impact in Dallas. We’re not (yet) categorized in an earthquake zone in spite of increasing nearby tremors. The power is pretty reliably here to run our HVAC and lighting systems. So why should we worry? We continue to design code-compliant buildings, not focusing on the fact that just meeting code makes them the worst possible buildings that one can legally build. Our environment faces two kinds of threats: acute, or sudden traumatic shocks, and chronic, gradual changes in our living conditions that affect us dramatically, but the impact happens gradually enough that there isn’t a given moment when we recognize it as a problem. The sudden shocks—tornadoes, floods, power outages—demand attention because they are such immediate threats. Response to them is often quite literally “do or die.” We do what we must, then after the fact we try to prepare for the next one, building a little taller wall or levy, strengthening the structure, or installing back-up generators. The resilient component of that response is that we learn from those events and become better able to respond to a similar occurrence in the future. But that’s not all of it. Resilience is more than disaster recovery. It’s not just getting back into your home as quickly as possible after the incident. It’s making sure that next time you don’t have to leave your community, but can stay in it safety. This is where designing for resilience begins. Thinking about designing for resilience has to start with consideration of the other kind of threats: the chronic ones that sneak up on us. We have noticed that severe storms seem to come with greater and greater frequency. It has been widely reported that 2015 had the highest increase in temperature on record, making it the hottest year ever. It’s clear that 2016 is already breaking those records. The record heat leads to fears of another drought, which will lead to further arguments about water supply. We have seen an ever-diminishing inventory of open green spaces, leading to habitat reduction and increased heat islands. We also now have greater threats of earthquakes, a previously unheard of issue for our area. None of these trends, though, cause us to suddenly take dramatic steps to change our buildings or our behavior. These are the chronic conditions that gradually make us change our response over time. Designing for resilience needs to begin with understanding the impact of these trends. For architects, the more interesting problem is learning from these events and incorporating new thinking into the concept of building performance. What level of survivability can be assured if the electricity goes out? How can a building contribute to community stability in times of crisis? What will the water supply be after several days without power? These questions might fundamentally change our approach to shaping the built environment. 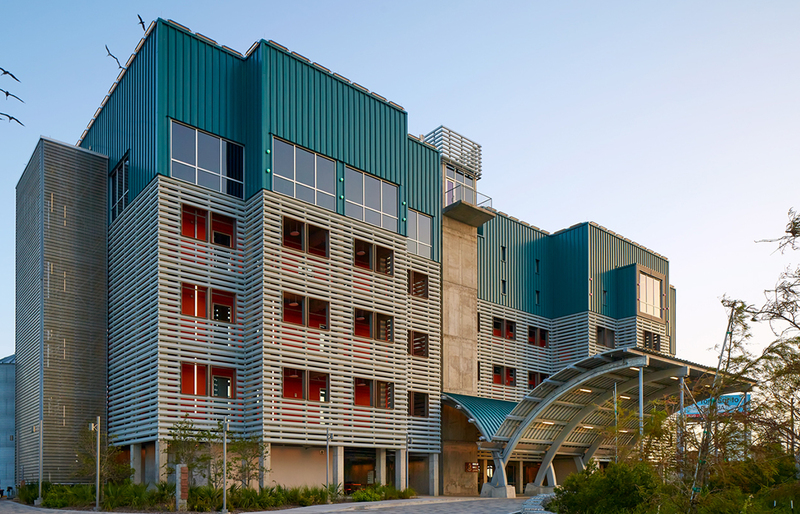 A lot of the design responses to the need for resilience are the same as design responses to the need for sustainability: passive ventilation that doesn’t require power, plentiful daylighting, siting structures away from fragile wetlands and coastal areas, and allowing the elements to enter and leave the building without damaging it. 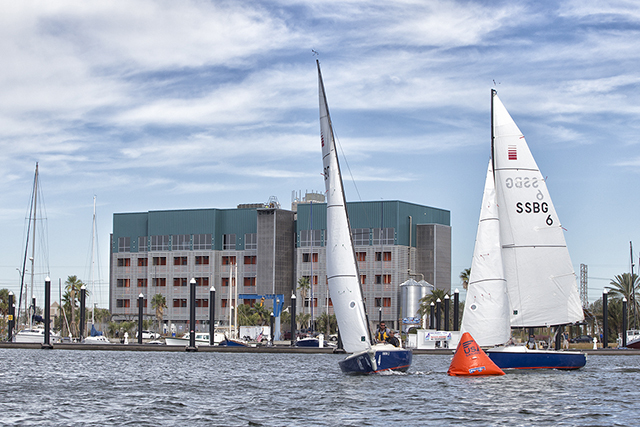 An excellent example of this last premise is the Sea Scouts Base in Galveston, designed by Shipley Architects. To capture the nautical experience for its youthful occupants, the building emulates a ship in its layout and materials. Being right on the coast, it will undoubtedly be subjected to storms; all materials are therefore weather-resistant. The exterior corridors offer a connection to the sea views as well as providing a shading device for the rooms. The ability of the ground floor to receive high water and to maintain functionality is the essence of resilient design. Another aspect of resilience is not directly attributed to the building, but can be enhanced by a project’s design. It has been shown that a community’s resilience is surprisingly correlated to its social connectivity. Buildings that are designed for the community, and especially with community involvement, are those most prized by those who live, work, and play in the neighborhood. 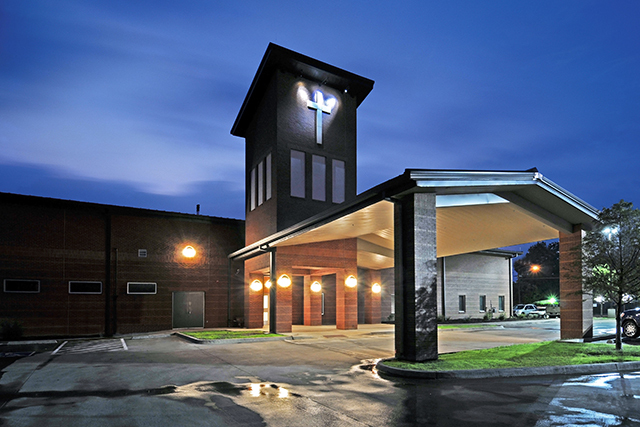 Buildings well-known in the community can serve multiple purposes in times of emergencies. First off, with emergency generators either built in or brought in for the task, buildings can provide power for the all-important cell phone chargers. They can also offer community bulletin boards for public information. It’s important, too, that first responders have a well-known location to establish a presence. These sorts of emergency services can pop up at a school, recreation center, church, or library—any building well-known in the area. 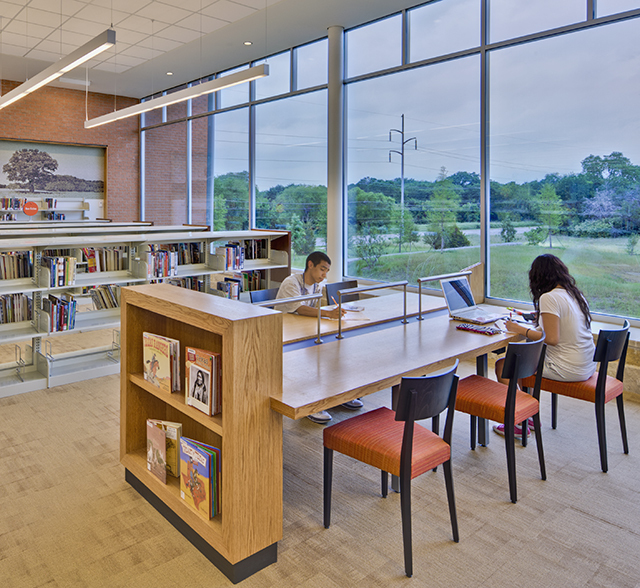 One such project is the Prairie Creek Branch Library by DSGN Associates. 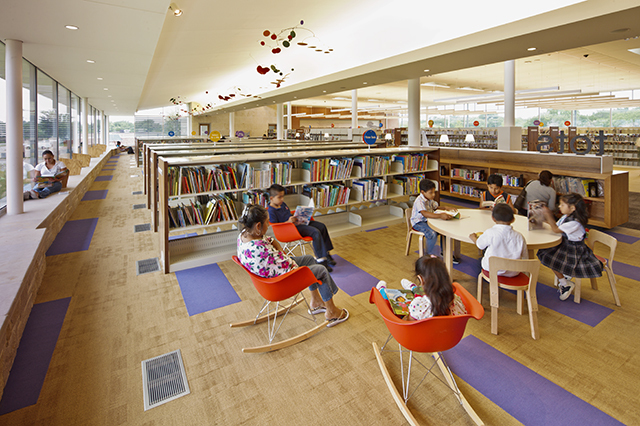 The new building replaced a much-loved and much-used library in Pleasant Grove. By involving the community early in the design process, the design team created a sense of ownership in the replacement facility. The main reading room provides expansive views to a re-created prairie, and can also be easily day-lit in a power outage. Because the community was so involved with its design, the library is an easy-to-remember access point for emergency gatherings. Another project that acts as a community center providing multiple services is the St. Philips School and Community Center with a recent addition by TH+A. The organization provides a safe alternative recreational opportunity for children in its urban Dallas neighborhood, strengthening the school’s ties to the local area, from which many of its students are drawn. Because the outreach programs that give the community a familiarity with the center, students will be comfortable convening there for support. The issues of designing for resilient communities are complex. 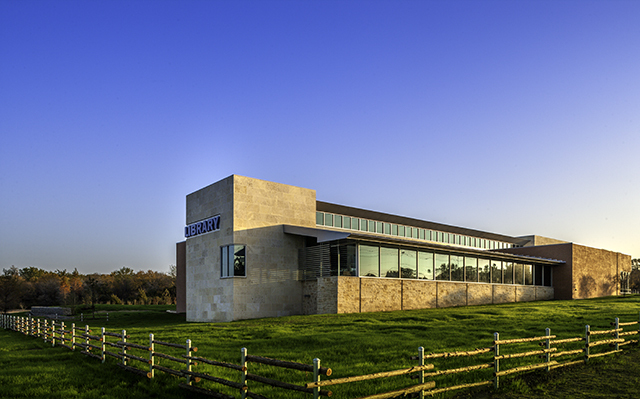 The process combines many of the skills that architects and engineers use to create excellent buildings that are responsive to the site, address environmental concerns, and contribute to the community. Understanding the many ways buildings help people cope with dramatic events will make architecture an important tool in facing these changes. Designing for resilience means doing what we do best. 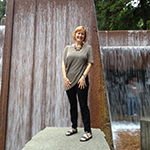 Betsy del Monte, FAIA is a principal with Transform Global and an adjunct professor in SMU’s Lyle School of Engineering.